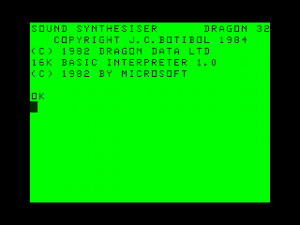 The Dragon 32 Sound Extension Module is a cartridge by J.C.B. (Microsystems), that contains a General Instruments AY-3-8910 sound chip (Also found on Amstrad CPC, Spectrum 128, +2 and +3, MSX, Atari ST and other machines). This allows the Dragon to play interesting sound effects and complex chiptunes without taking all processor time. The cartridge also adds two 8-bit I/O ports (provided also by the AY-3-8910). The sound chip can be operated via the new commands in BASIC provided in the cartridge ROM, or via the 0xFEFE and 0xFEFF addresses. This page was last modified on 17 August 2015, at 15:55.